Volume I focuses on the rationale for sexuality education and provides sound technical advice on characteristics of effective programmes. Volume II focuses on the topics and learning objectives to be covered in a ‘basic minimum package’ on sexuality education for children and young people from 5 to 18+ years of age and includes a bibliography of useful resources. In many parts of the world, a combination of social taboos, unavailability of sound information, lack of resources and infrastructure make it difficult for children and young people to access sexuality education aimed at improving knowledge and reducing risk.This leaves many young people vulnerable to coercion, abuse, exploitation, unintended pregnancy and sexually transmitted infections, including HIV. According to the UNAIDS 2008 Global Report on the AIDS Epidemic, only 40% of young people aged 15-24 had accurate knowledge about HIV and transmission. It should come as no surprise that, against this background of insufficient levels of basic knowledge, young people aged 15-24 account for 40% of all new HIV infections (UNAIDS 2009 AIDS Epidemic Update). 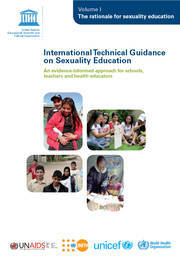 In response to this challenge, the voluntary and non-mandatory International Technical Guidance on Sexuality Education, developed by UNESCO in partnership with UNAIDS, UNFPA, UNICEF and WHO seeks to assist education, health and other relevant authorities to develop and implement school-based sexuality education materials and programmes.